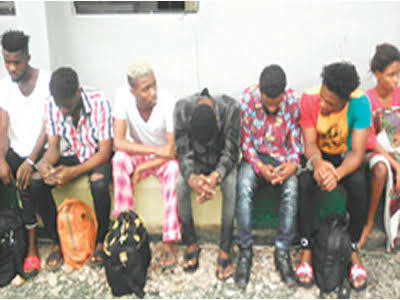 The Commissioner of Police in Abia State, Mr Anthony Ogbizi, on Thursday paraded suspected homos*xuals, who were arrested by security agents in Aba, the commercial hub of the state. He said the suspects were arrested at City Gobal Hotel in Aba at about 2am. Fred Ndubuisi, Anyanwu Chidera, Kamsiriochukwu Onuoha, Anderson Emeruwa, Sampson Nwadike and Nnadi Promise. It was further gathered that the manger went to one of the hotel rooms, where two of the suspects had checked in earlier and discovered that they were six in the room, romancing and kissing one another. He said, “I arrived the hotel at about 6pm and I asked my friend to book for a room for me. The hotel management said we should pay N5,000 for a room and we could (not) afford it. So, we decided to manage that one room.